This site in Southville is currently used by a mix of short-term let office, warehousing and workshop space including Bristol Auction Rooms on the site of the former Ashton Gate Brewery. The site faces onto North Street below the Brewery Theatre and overlooks Greville Symth Park across Ashton Road to the west. Change Real Estate is the developer and their architects are the Nash Partnership. 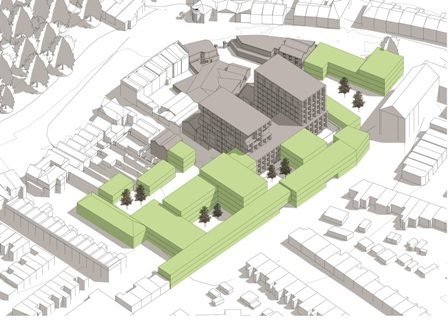 The scheme would redevelop this 0.47 ha site comprehensively to deliver about 148 new homes and 2,000 sq.ms. of commercial space. 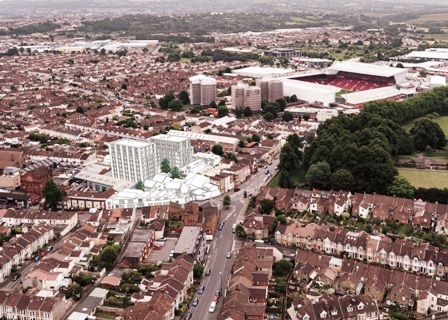 The Society supports the proposal which will retain an element of employment in addition to the new apartments. Although there are no listed structures on the site, the scheme will retain several attractive 19th century buildings associated with the former brewery to create a positive sense of place. The structures include the retained facades of the manager’s house and the stone facades of several brewery buildings. The retained Byzantine Gatehouse and the entrance piers will emphasise the principal entrance into the courtyard from North Street. The new buildings on North Street will feature a pitched roof forms to reflect the style and scale of nearby buildings. The site will include two courtyards. The public will have access to the North Street courtyard which contains the commercial space. The second courtyard will be reserved to the residents. This will be a densely populated development. Our concerns are that the two tall residential blocks do not exceed height of other nearby tall buildings and that their detailed design is to a high standard to avoid the monolithic appearance of many taller frame and panel buildings. Bristol Civic Society’s full response [PDF, 362KB] Right-click to download, click to view.